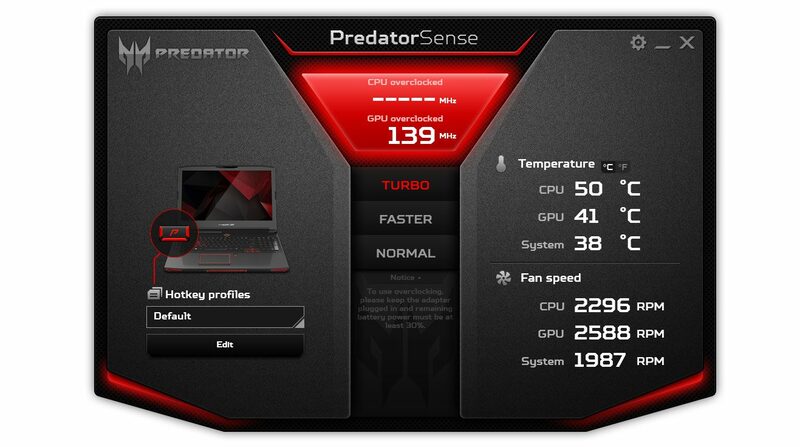 Summary: The Predator 17X is a solid 17-inch laptop with powerful internals: Intel Core i7-7820HK processor, overclockable desktop grade Nvidia GTX 1080 graphics, NVMe storage and TB3 connectivity, among others. 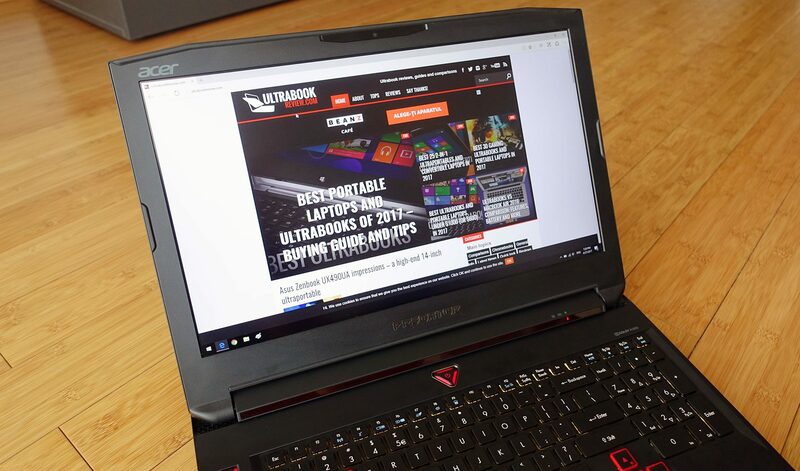 It's also a laptop that performs well in pretty much all situations and runs fairly cool, which makes it a good buy for those interested in getting the best mobile performance for their buck. 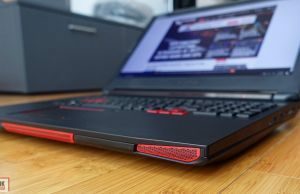 Corners were cut when it comes to some design aspects, screen options, hardware temperatures and certain features when compared to the competition, but spec-per-spec this is one of the best high-end gaming laptops in the $2700 to $3000 price range. 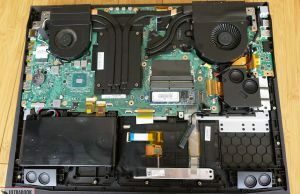 A few years ago buying a gaming laptop equaled a compromise in performance when compared to a classic desktop computer, but that’s no longer the case these days, as the most powerful notebooks bundle components mostly on par with their desktop counterparts. 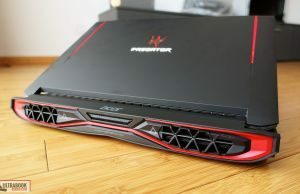 One such laptop is Acer’s Predator 17 X, a 17-inch notebook with an overclockable Core i7 Kaby Lake processor and desktop-grade Nvidia GTX 1080 graphics. 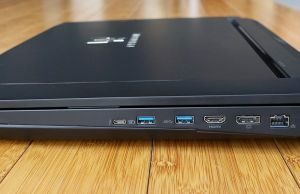 It’s a chunky machinery, as expected from a laptop with such specs, but it’s a beast able to handle pretty much every game on the highest details levels, plus it’s a somewhat more affordable option than its direct competitors from Asus, MSI or Alienware. One thing you should know from the beginning is that we got to test a review sample and not a retail unit, thus a few aspects did not work exactly as advertised. 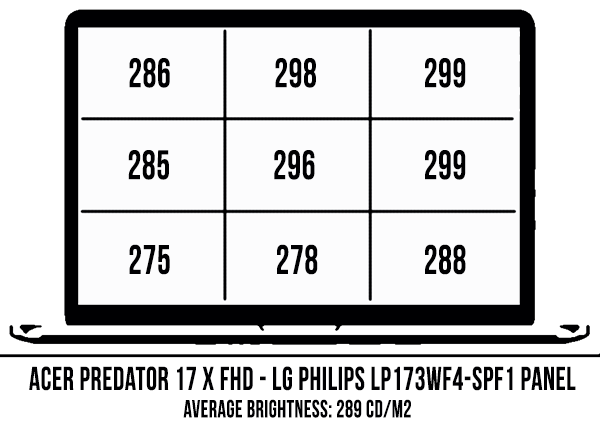 We’ll talk about these and all the other details in the rows below, and by the end you’ll know whether the Predator 17X is the right gaming notebook for you or not. 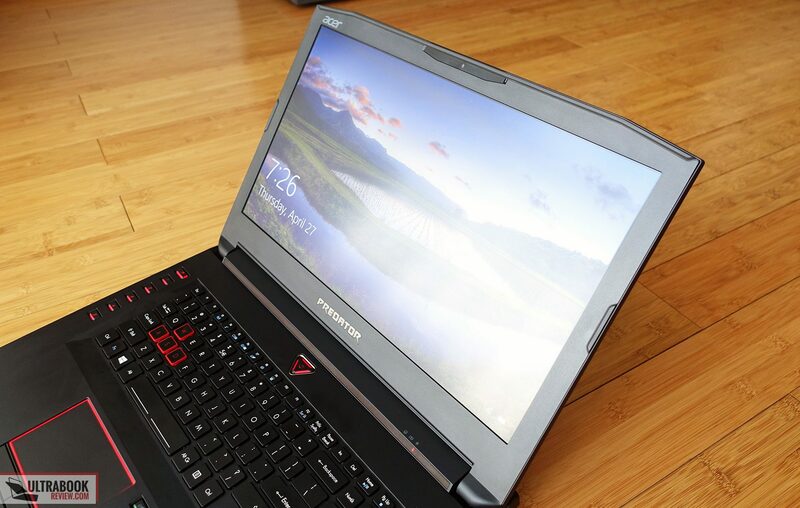 The Predator 17X is a chunky and heavy notebook, at 1.64″ tall and 9.5 lbs on our tested configuration. 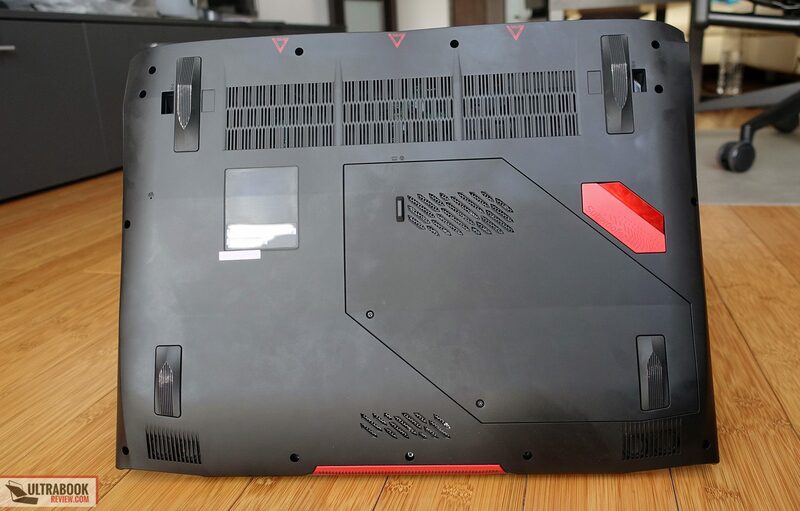 It has a big footprint as well, due to the space required by the cooling solution on the back side, which means it’s not going to fit in most backpacks, especially when you consider there’s also a massive 330W power brick to carry around. You will find some big enough options to allow you to lug this around though. The 17X is also very well built. Although its entire chassis is made from plastic, including the exterior shell and the inner frame, it doesn’t squeak, bulge or flex, so it should handle everyday hassle just fine. 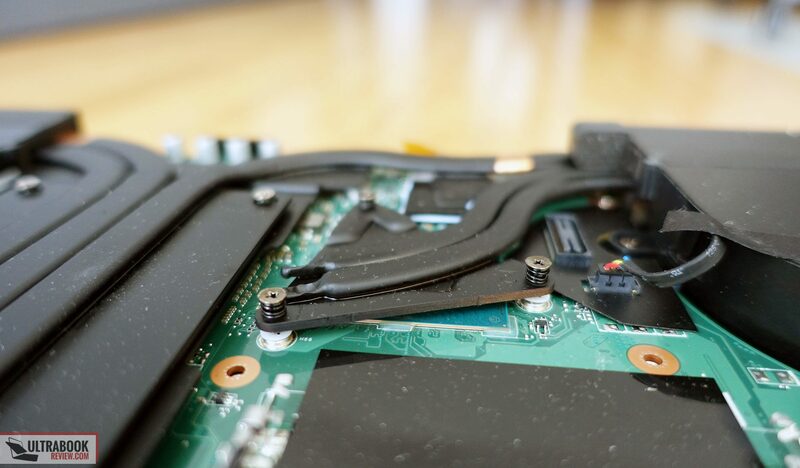 The two hinges that keep the big screen in place seem well made too, strong enough to keep the display as set, yet smooth enough to operate with a single hand without lifting the laptop’s main body from the table (not a surprise, given its weight). The screen leans back to about 145 degrees, enough for desk use, where such a computer will spend most of its time. 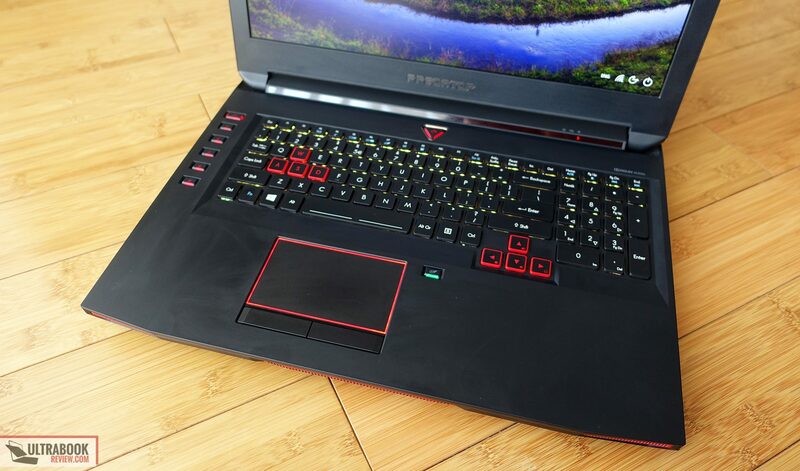 As far as aesthetics go, the 17X looks just like all the other Predators: it’s made of black rubbery plastic that feels nice, but shows smudges very easily, with some chromed elements (logo on the lid, Predator branding under the display) and red accents (grills on the front edge and on the back, around the exhausts). 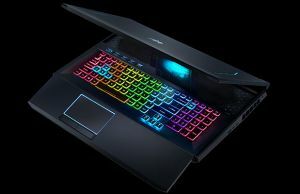 Add sharp lines and a bunch of light bars and lit buttons, and you’ll end up with a laptop not meant for conservative business environments, and not the most stylish either, at least in my opinion. But design lines are entirely subjective, so many of you will probably like it. What bother me a lot more are the various lights that can’t be switched off. On the inside, there’s the pretty chunky power button, the macro keys on the left side of the keyboard and the button used for activating/deactivating the touchpad, plus the bright status LEDs placed just under the display. All these can’t be switched off and are darn annoying when trying to watch a movie in a dark room. 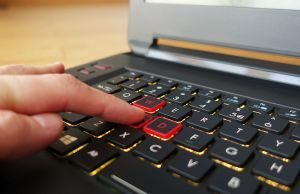 The keyboard is also illuminated, but it can be switched off. 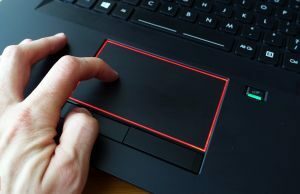 The trackpad is framed by a lit border which can’t be controlled individually, as it’s tied to the keyboard’s illumination. So when the keyboard’s lights are on, the framing on the trackpad is on as well, and the other way around. 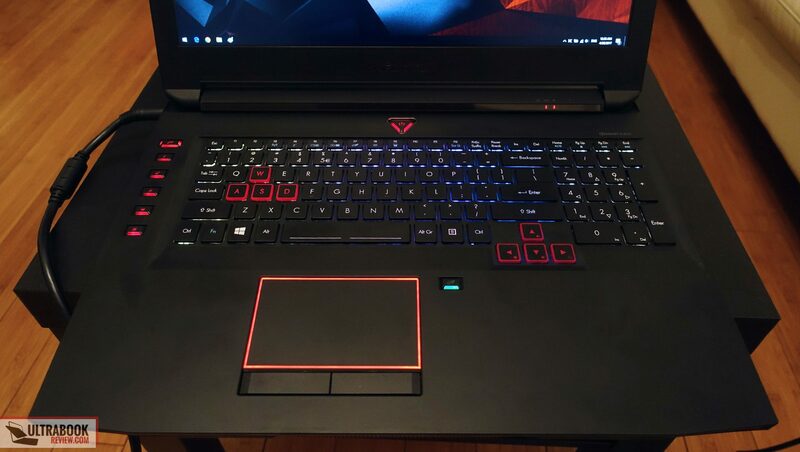 Unfortunately the light bars and the illumination of the logo on the hood are also tied to the keyboard’s illumination as far as I can tell, which means they’ll also lit when the keyboard is lit. I’ve been complaining about these aspects since the first Predators came out and I’d sure hope Acer would address them at some point. A revised, fresher design would be best, but in the meantime a software update that would allow to individually control all these lit elements could do the job. On the practical side, I was pretty happy with this laptop. 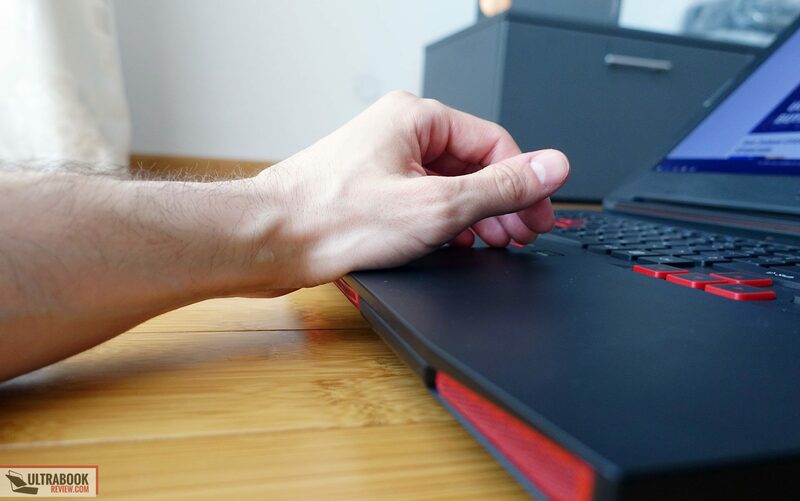 The soft exterior makes it easy to grab and will probably fend away scratches, the interior is roomy and slightly sloped down for a more ergonomic typing position, plus the hinge is easy to operate. The front corners and lip are rather sharp though and quite tall, which means some people might find them digging into their wrists, but it wasn’t a serious issue for me due to the large palm-rest. 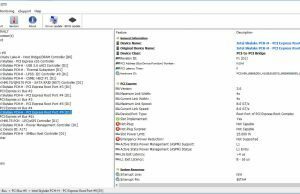 As far as IO goes, there’s pretty much everything you’ll want on this laptop, including a Thunderbolt 3 port, DisplayPort and HDMI 2.0. Most of the connectors are on the right side though, as you can see from the pictures. 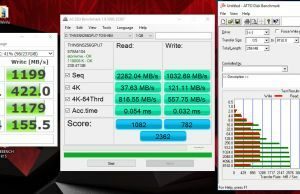 The TB3 port is capable of 4X PCIe 40 Mbps speeds, so it will allows users to hook up 4K 60 Hz monitors, as well as other peripherals. 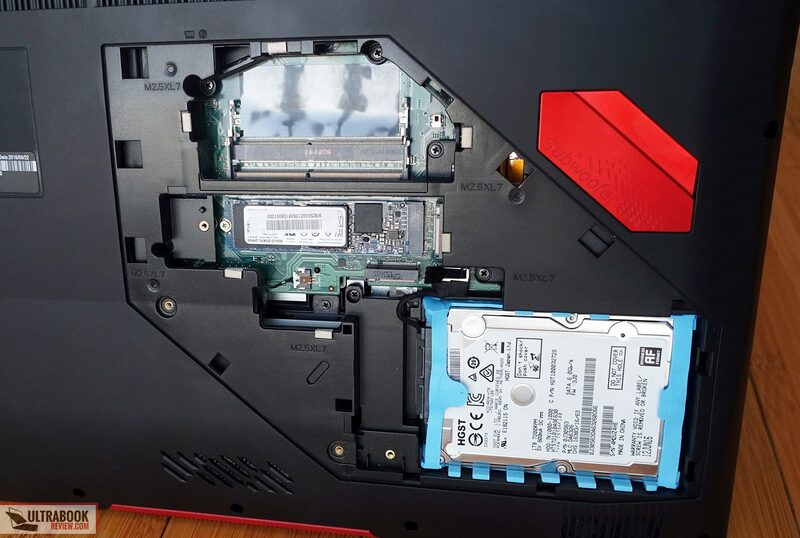 Before we wrap up this section we should also flip the laptop upside down and have a look at the underbelly, also made out of plastic. You’ll notice the big and grippy rubber feet here, the speakers and subwoofers, as well as a quick-release panel that gives access to most of the internals. More about these further down. 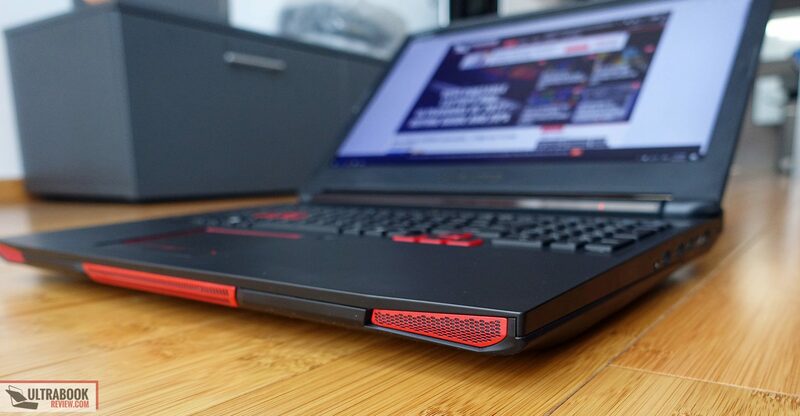 You’ll also notice the massive air-intake grills, as the hardware inside the laptop requires serious cooling power. Air is sucked from the bottom and from the vent on the front lip, then pushed out through the massive exhausts on the back edge. 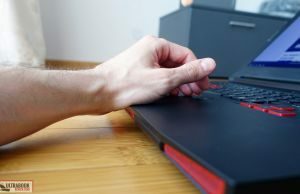 I’m mostly accustomed to short-stroke keyboards, that’s why I have a hard time getting used to keyboards like the ones on the Acer Predators, whose keys travel around 22 mm into the frame. 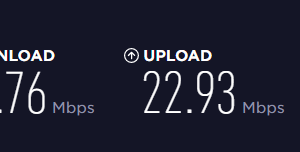 As a result, although I did enjoy typing on this laptop and do consider the overall feedback to be good, my speed and accuracy suffered, as you can see from the picture below. Most people should find this keyboard above average though, especially since it comes with features gamers will appreciate, like anti-ghosting and the ability to register multiple simultaneous presses. That aside, the keyboard on this Predator 17X gets an excellent layout, with properly sized and spaced keys, plus the arrow keys slightly separated from the others. The keys are also backlit with RGB LEDs, but there’s a single brightness level available, so there’s no way to adjust the intensity. The keys can’t be individually controlled, users just get four light zones that they can tweak in the Predator Sense app (three for the main keyboard and another for the NumPad). 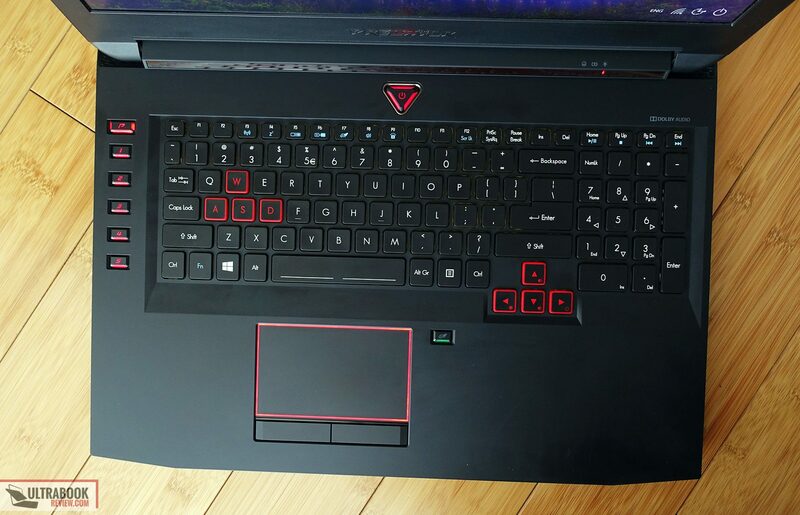 Acer also included a set of macro keys on the left side of the main keyboard, which cab be tweaked from the Predator Sense app as well. In total, you can create 3 groups of 5 commands each, for a total of 15 macros. You can also set up macros in games, of course. The trackpad is placed beneath the keyboard, centered on the Space key, and I’m happy with how it felt and performed in my tests. It’s not very large, but it’s slightly lowered into the frame and has a smoother texture than the palm-rest around, plus it handled daily swipes, gestures and taps smoothly. 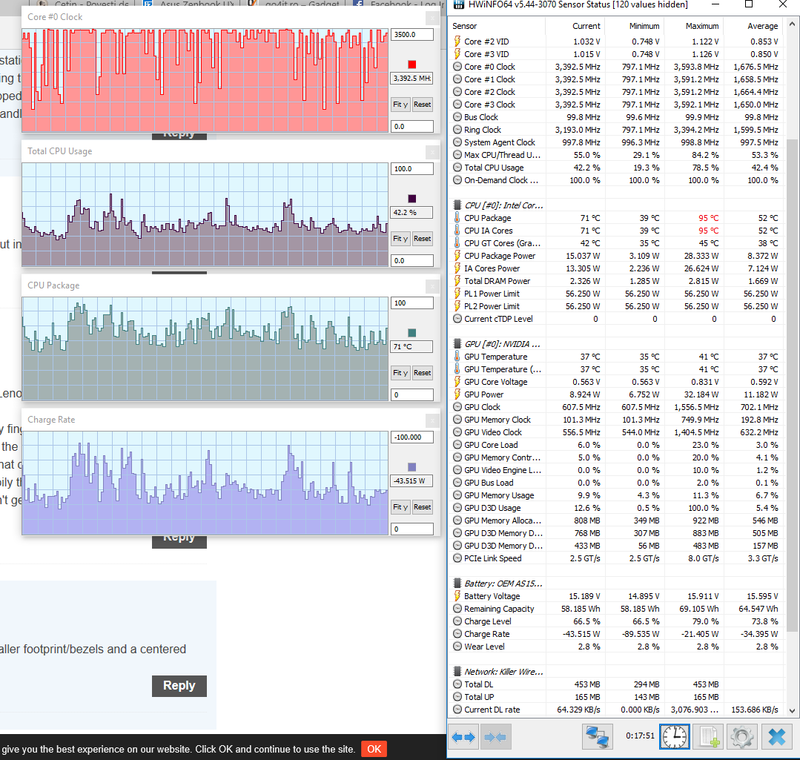 The physical clicks button beneath are its biggest selling point though. On the other hand, the lit framing is what annoys me the most, alongside the physical button meant to turn the trackpad on and off. The light bar is lit all the time when the keyboard’s backlit is also activated and switches off when the keyboard’s lights are switched off as well. The button though is always lit, green when the trackpad is active and red when it’s off. Acer offers the Predator 17 X with two screen options, both 17-inchers with IPS matte finishing, but one with a FHD panel and another with an UHD panel. We got to test the former, which is a FHD IPS panel that runs at 75 Hz and supports GSync. 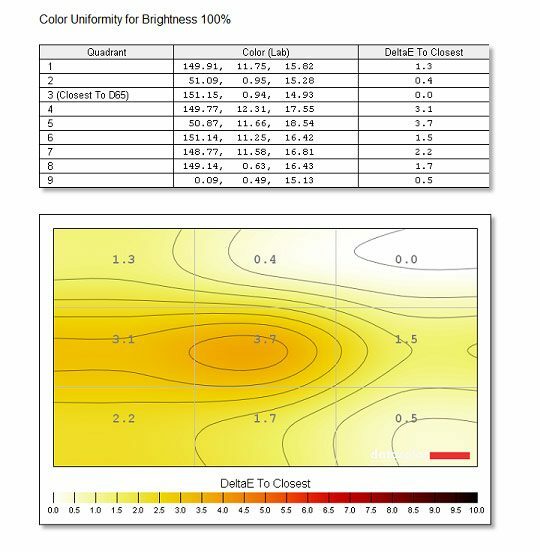 It’s a good option that showed minimum trails of light bleeding around the edges and scored fairly well in our tests in terms of brightness, contrast and color accuracy, as you can see below (measured with Spyder4 sensor). 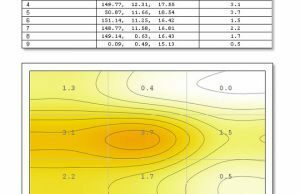 The white point is severely skewed by default, but you can use our calibrated profile available over here to address it. 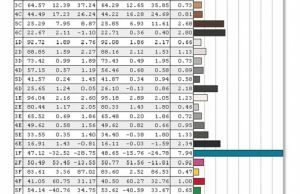 Average DeltaE: 1.22 uncalibrated, 1.10 calibrated. This FHD panel is also a fairly good match for the hardware inside, allowing you to play most games at 75Hz with details cranked all the way up, and leaving you the option to hook up an external monitor for higher-resolution gaming. 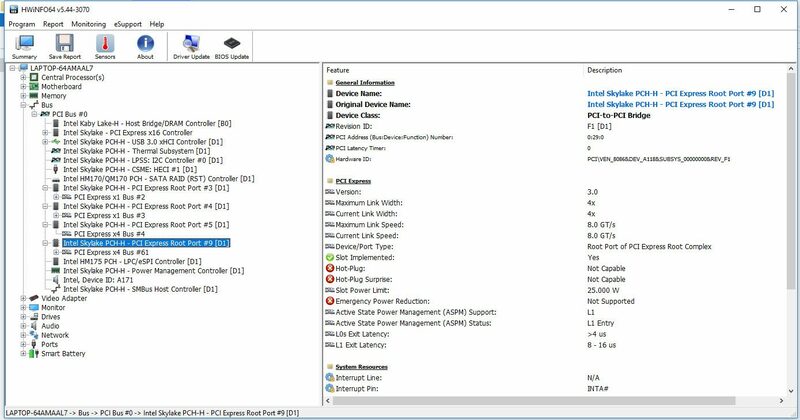 Other reviews noticed there’s no PWM used for brightness control on this panel, however response times are a bit high (around 30 ms Black to White), which those interested in fast pace gaming might find inadequate. 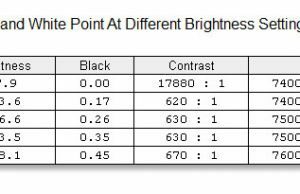 The UHD panel on the other hand looks (the AU Optronics panel also used on the Predator 17 and Aspire Nitro V17) much crisper due to the 4x increased resolution and it’s a wide-gamut panel with more popping colors. It also supports GSync, but limited at 60 Hz, and it’s a significantly more expensive option. 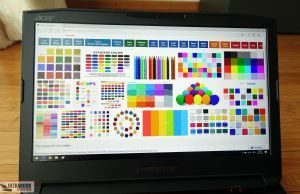 So while I do think this variant is a step-up for everyday use and graphics related applications, I’d still recommend the FHD panel for those of you primarily interested in playing games on this computer. Our test unit comes in a mid-level configuration that includes a top-tier Core i7-7820HK processor, the Nvidia GTX 1080 gprahics chip, 32 GB of DDR4 RAM, a 256 GB NVMe SSD and a 2.5″ 1 TB 7200 rpm HDD. Acer also sells the laptop with a Core i7-7700HQ processor, which is non-overclockable option, plus various amounts of memory and storage. 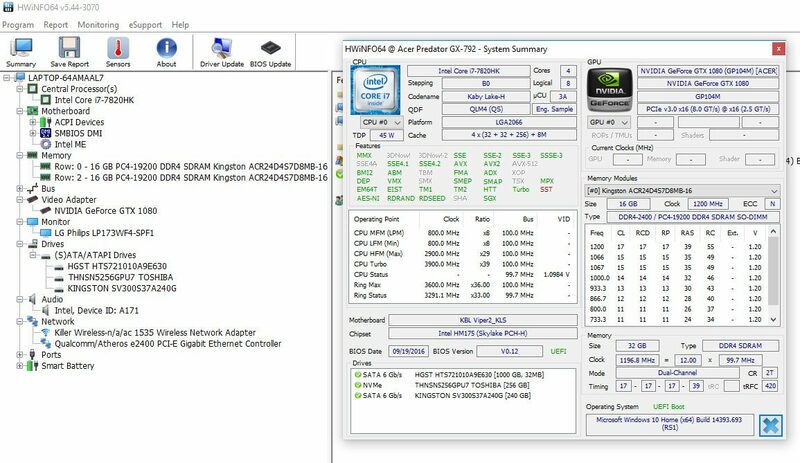 These are easily upgradeable though, so the decision to make is whether you want to standard CPU or the Core HK option. More about this in a bit. 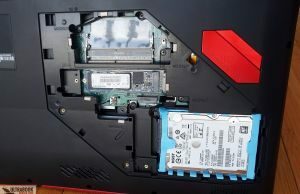 This laptop allows users to easily access two of the RAM slots (the other two are behind the motherboard), as well as the M.2 80 mm NVMe and the 2.5″ storage bay. These are hidden behind a removable panel hold in place by two screws. However, if you want to get to the wireless chip or the cooling system (for repasting), you’ll have to remove the entire back shell. 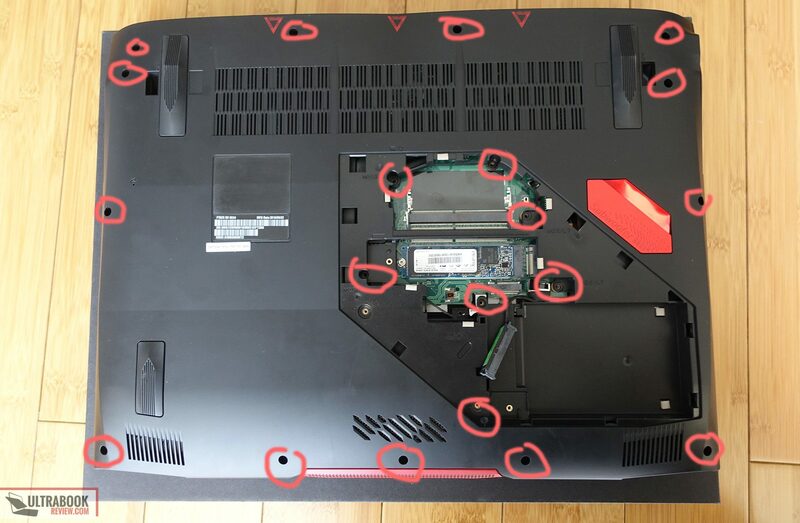 It’s not complicated, you’ll need a Philips screw and some patience. 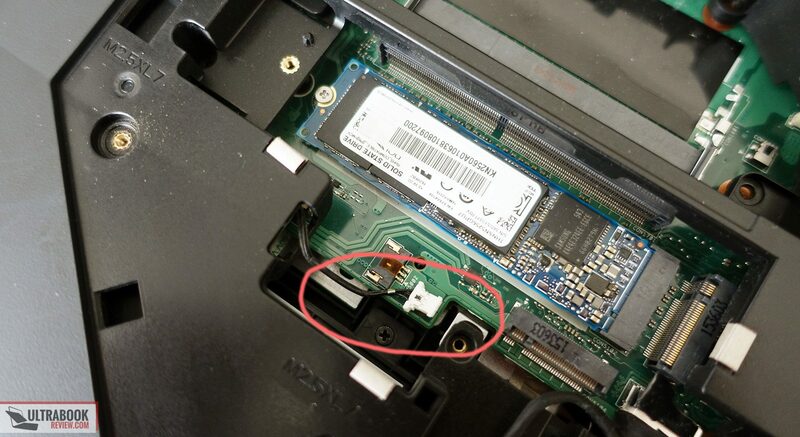 First, you need to gently pull the 2.5″ HDD out and unhook the connector. 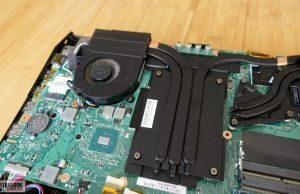 Then, you need to unhook the bottom fan, which is fixed in the outer shell, there’s a small connector for that, visible in the pictures below. 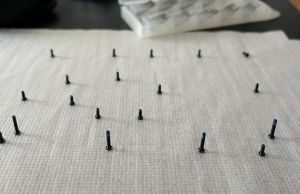 With these out the way, you can start unscrewing the screws around the back. Make sure you note where you took them from, as some of the ones towards the back are larger than others. Once this step is done, use plastic priers to pop out the case. 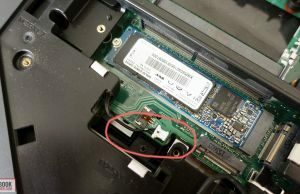 I found ti easily to unclip it from the front of the laptop, but there are also some stubborn clips on the back. The entire back edge is attached to the bottom so they come apart together, which means the clips are toward the top of the back edge. 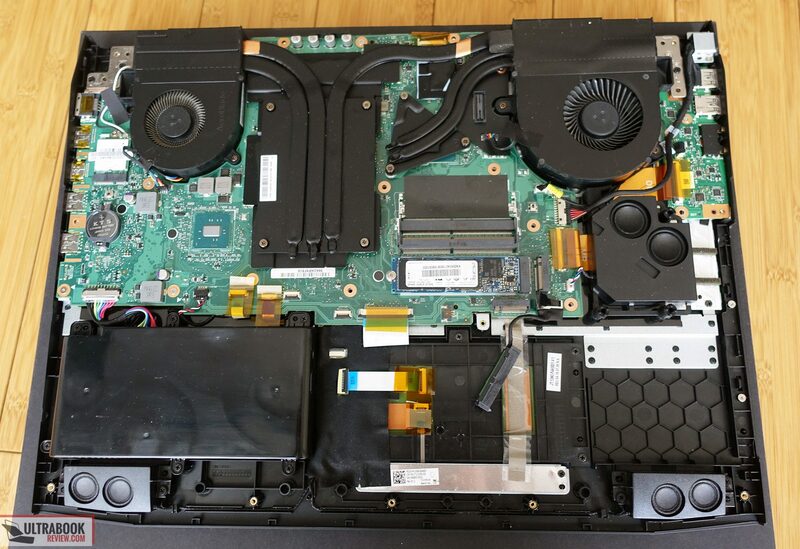 The bottom should come of fairly easily and get you full access to the heatpipes, fans, battery and the wi-fi module. Taking the cooling system out to reapply better thermal paste it’s an easy step from here on, as it’s hold in place by a few screws, but I wasn’t allowed to do it on this sample. 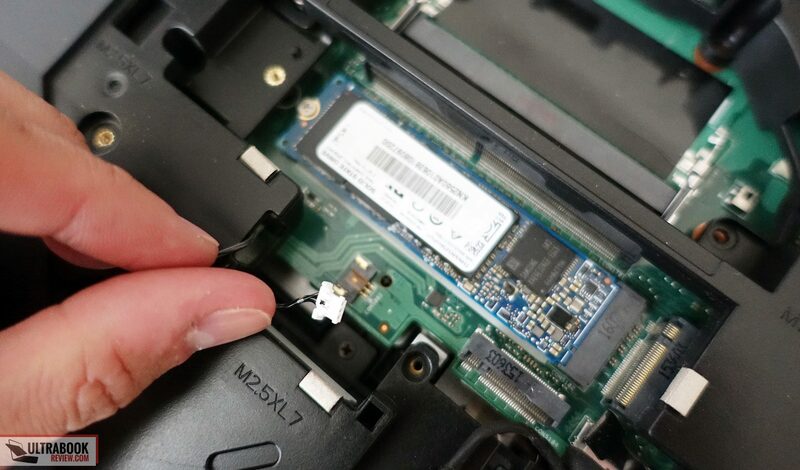 One final thing I will add here is that there should be no warranty stickers that you’d have to break in order to get inside this laptop, yet you should proceed on your own risk and make sure you known what you’re doing. 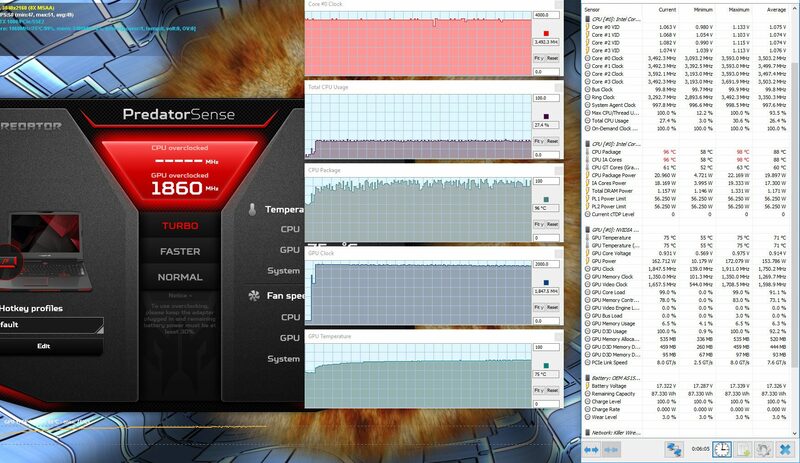 With that out of the way, let’s focus on how this machine performs. 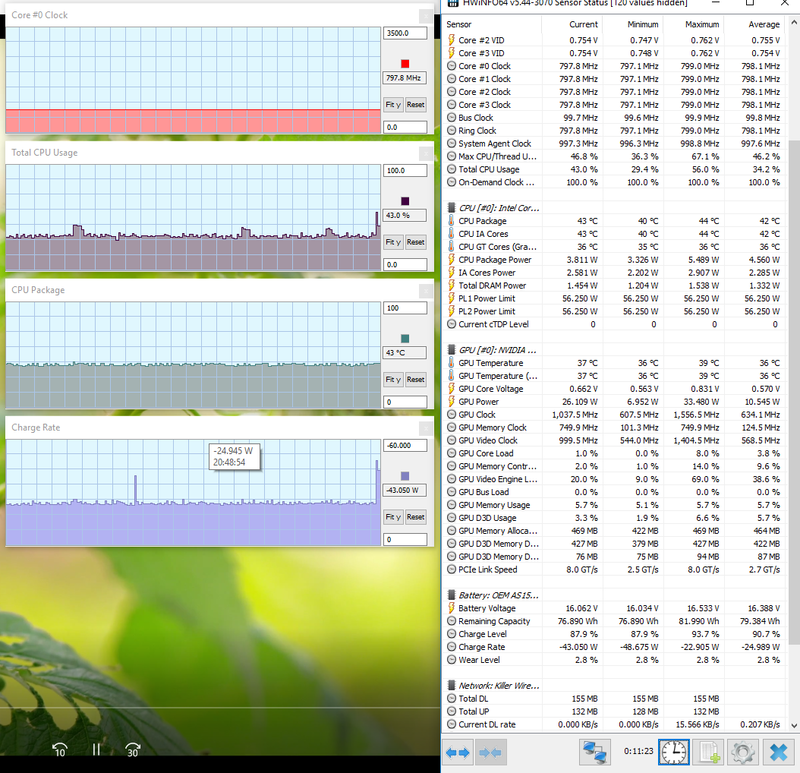 There’s some bloatware, but even so daily performance is buttery smooth, thanks to the fast processor and storage. There’s really nothing you can throw at this thing that it can’t handle. 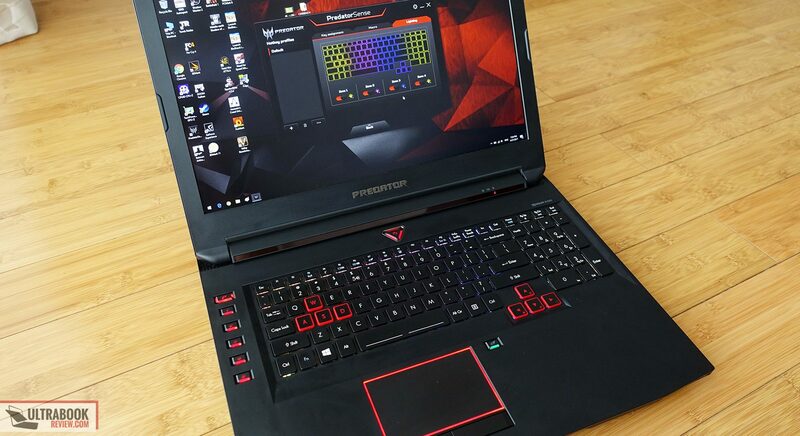 The Predator 17X is also a proper workstation for graphics enthusiast, programmers and even photographers, but gaming is what it’s truly made for and where it shines, otherwise you wouldn’t need a GTX 1080 GPU and a GSync screen. We got to test the FHD version of this screen, which means most games I’ve tried were easily capped at 75 fps even on Ultra Details, with few exceptions. 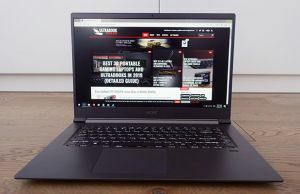 That aside, as I mentioned in the beginning of the section, users would have the option to choose between Core i7-7700HQ or Core i7-7820HK processors on this laptop. 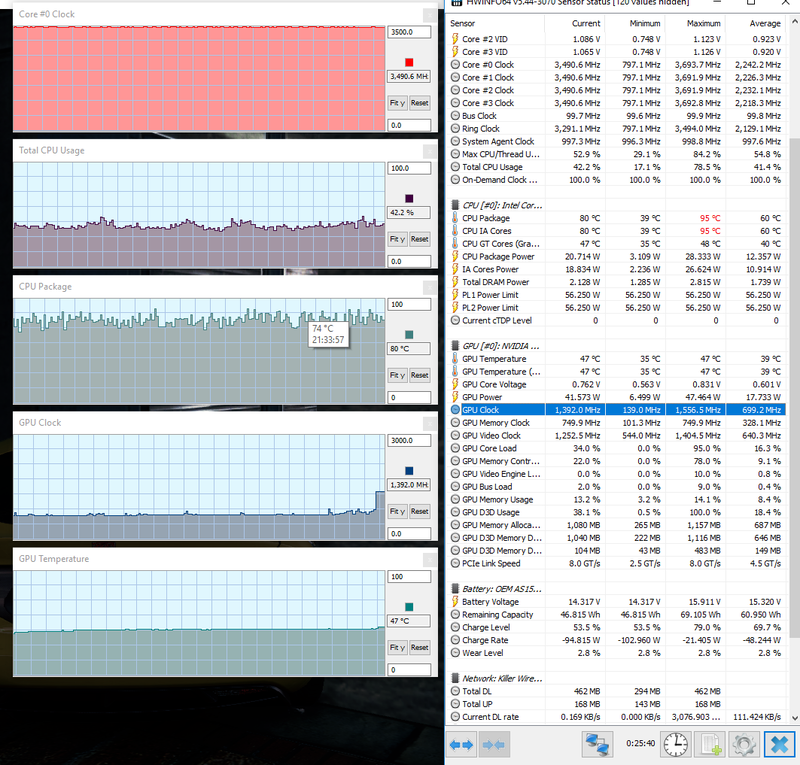 The latter is more expensive, but unlocked and thus overclockable. 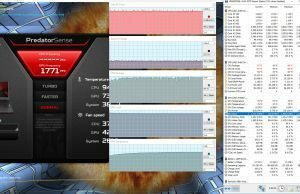 Acer makes basic overclocking easy: users can choose between three different modes (Normal, Faster and Turbo) in the included Predator Sense app, which slightly boost the CPU and GPU frequency. 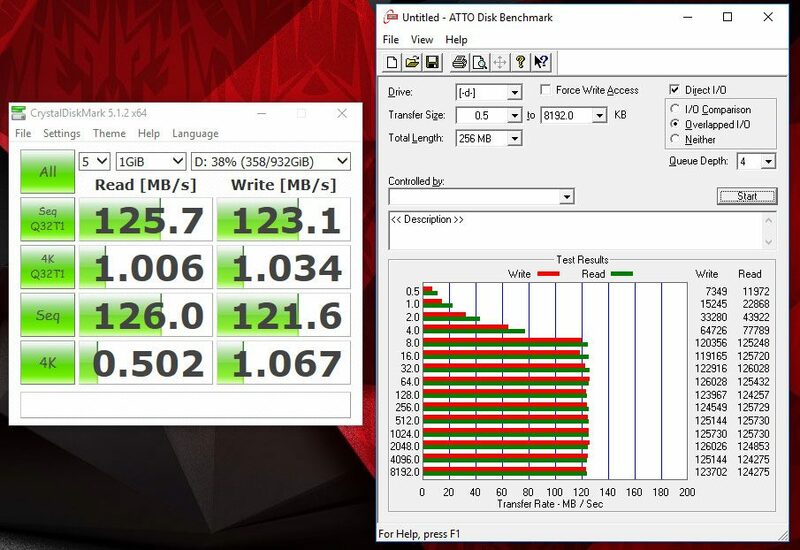 However, something was flawed with our particular testing unit, as the modes had no impact on the CPU’s speeds, and only updated the GPU clocks, due to the fact that our version is a test-sample and not a retail version. 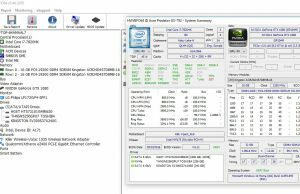 The Core i7-7820HK processors is clocked at 2.9 GHz, with Turbo Speeds up between 3.5 GHz (multi core) and 3.9 GHz (single core). 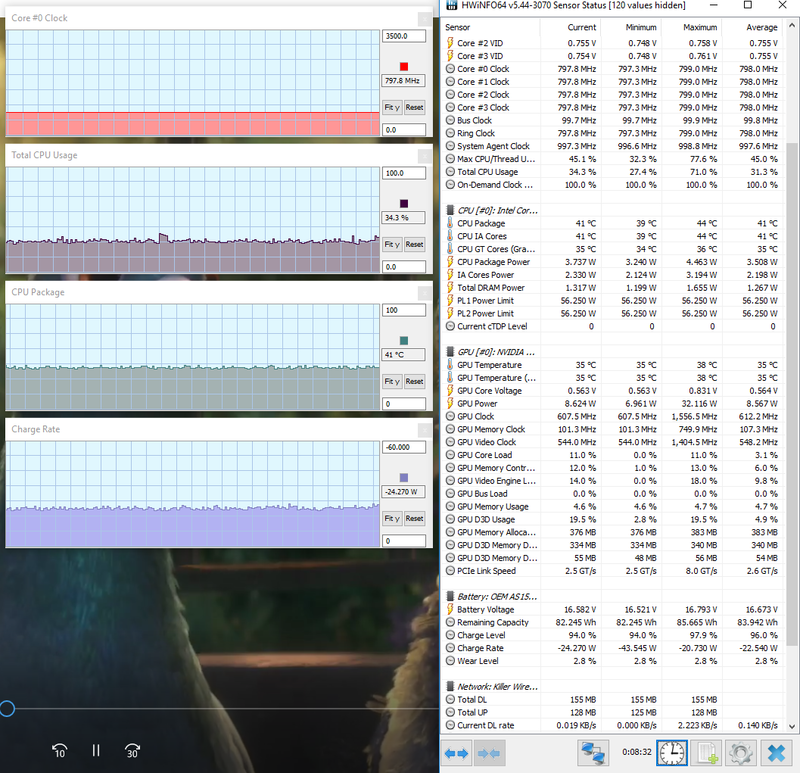 Choosing the Turbo mode should push Turbo Speeds up to 3.8 – 4.3 GHz according to Acer’s literature. 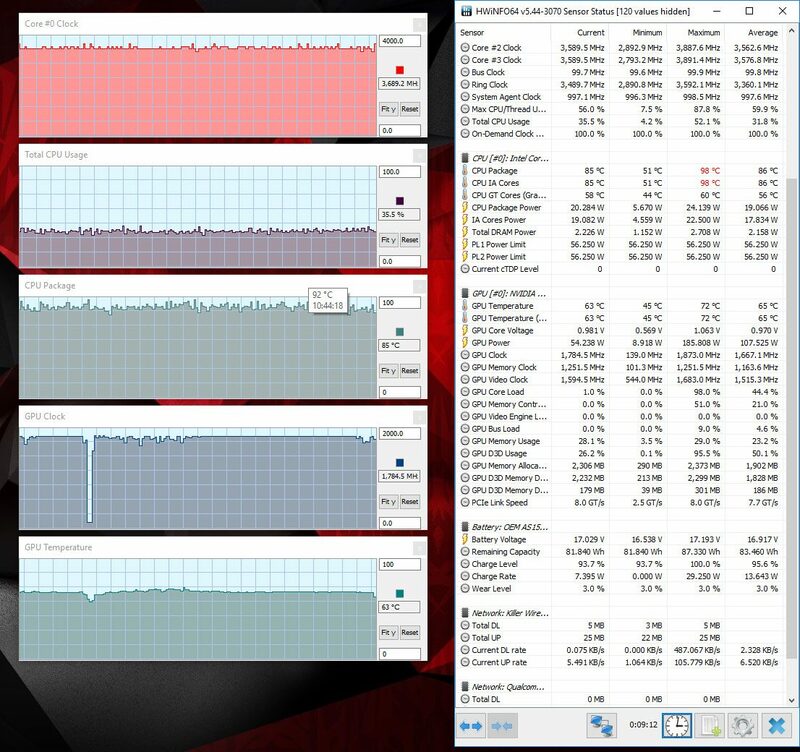 However, the cores on our test model were stuck at 3.5 – 3.9 GHz, regardless of the chosen profile. 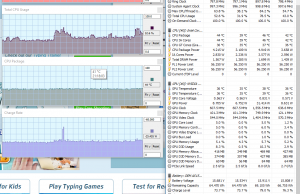 The GPU on the other hand clocked upwards in Turbo, as you can see in the next two pictures that show GPU benchmarks with Furmark. 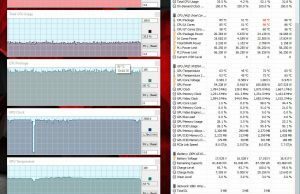 However, the average GPU clock and Memory clock gains between the Normal and Turbo modes were small, and thus the increases in everyday use and even benchmarks were minimal as well. 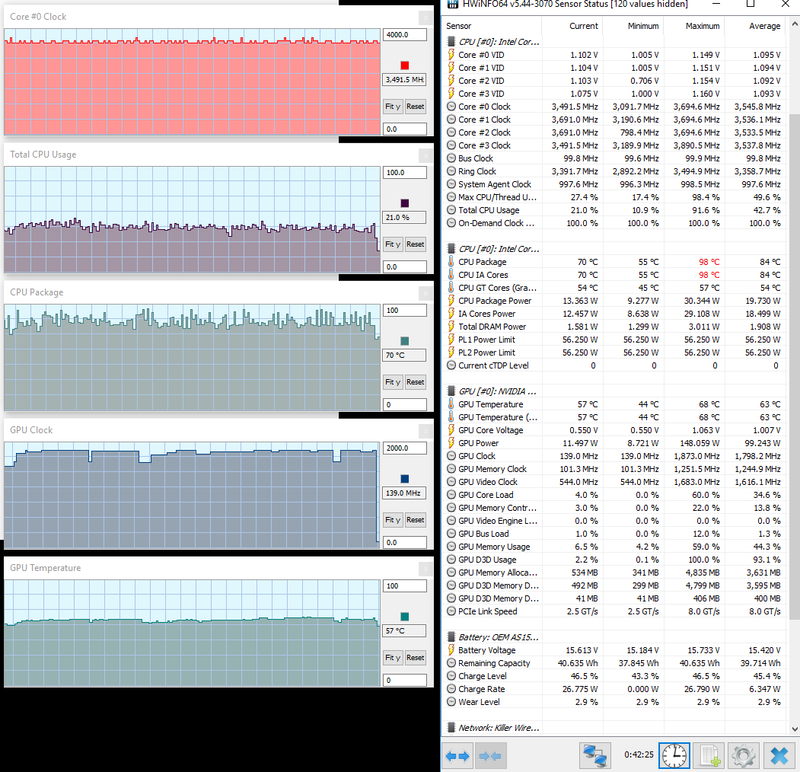 x264 HD Benchmark 5.1 64-bit – Normal: Pass 1 – 80.53 fps, Pass 2 – 15.54 fps. 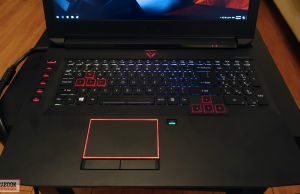 Again, I must stress that the retail version of the Predator 17x in this configuration will overclock better and offer roughly 10% improvements between modes (according to other reviews, like this one and this one). 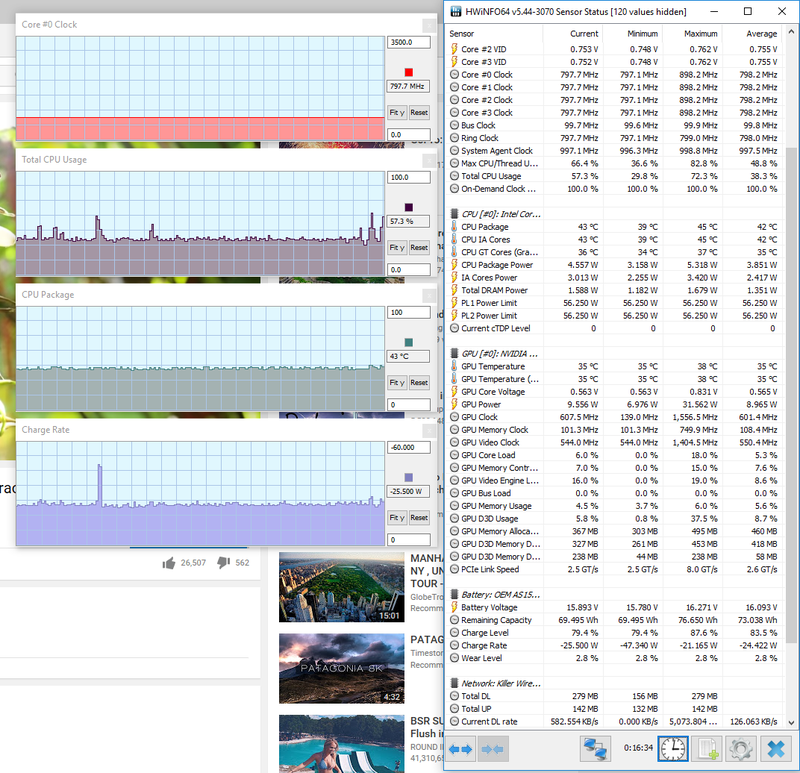 Repasting the CPU and GPU will be probably help in order to get the most out of the configuration. 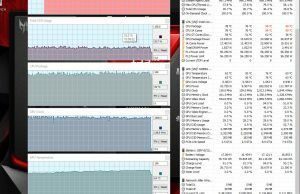 Compared to the Core i7-7700HQ version, the Core i7-7820HK offers a 10-15% increase in benchmarks scores and fps scores in games, with a toll on temperatures. Whether if that’s worth upgrading or not is up to you. 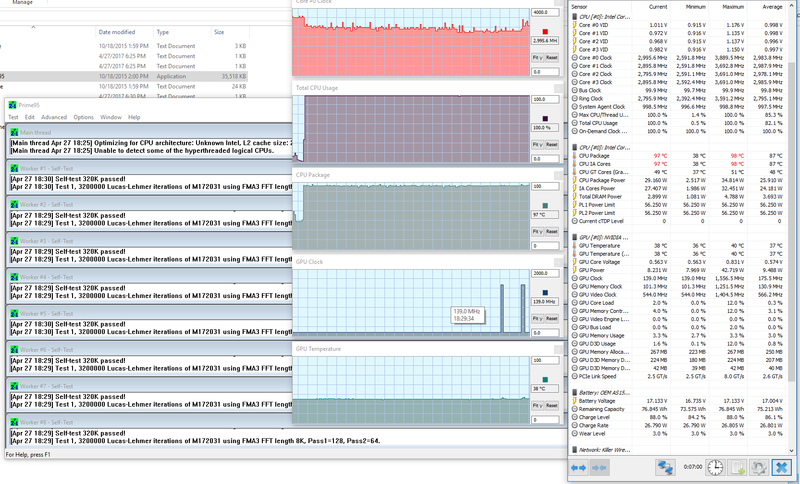 Before we jump to details on temperatures and acoustics, I’ll also add how our test unit performed in stress tests. CPU throttling occurs both when stressing the CPU with Prime 95 and when stressing the CPU and GPU simultaneously (Prime 95 and Furmark), as shown in the pictures below. 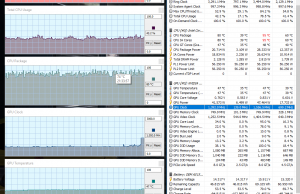 There’s no GPU throttling though. 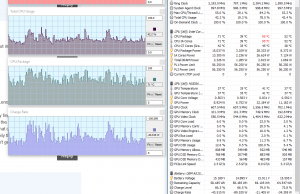 Just like in other tests, the CPU’s package reaches its thermal limits fast, which is abnormal and suggests either a poor design, or poor pasting. There are three fans on the Predator 17 X, one helps with fresh air abduction through the grills on the front lip, and two push hot air through the grills on the back. They’re always active, but they’re not noisy with daily use. My iPhone app (Decibel 10) reports a normal fan noise of around 36 dB at ear level in a room with an ambient noise of 33-34 dB. That’s audible, but would be easily covered by music or a movie. 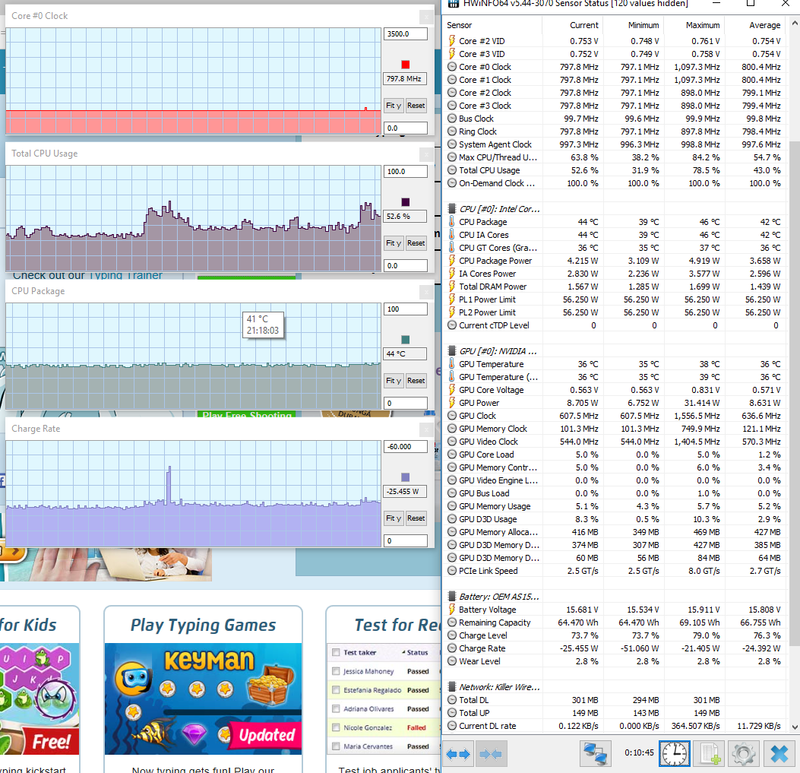 Under load, the Predator 17X gets much nosier, around 47 dB at ear level, according to the same app. The speakers can cover the fans in most cases, but you’ll probably want to use some headphones anyway. 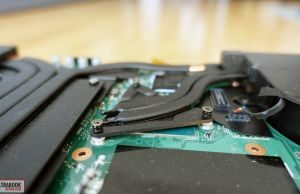 The spinning HDD is also a potential noise source, and could be upgraded to an SSD. 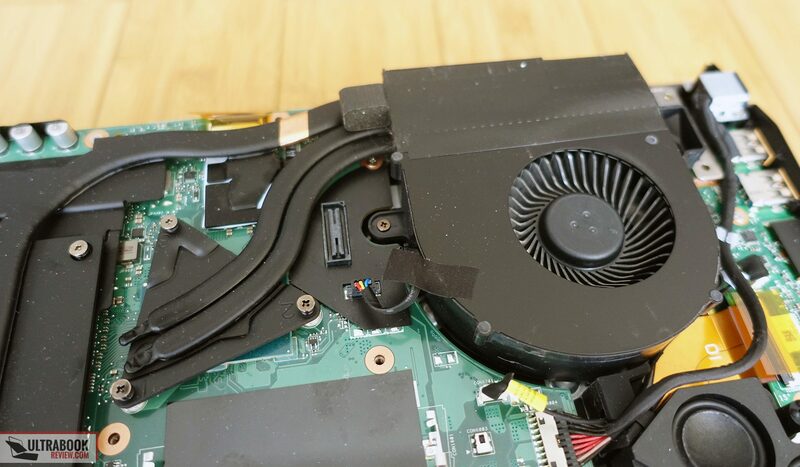 That aside, I didn’t notice any electrical noise, but I should mention that Acer’s Dust Defender system (which occasionally spins the fans the other way around in order to push dust out) has a distinct rattling that I for one find annoying when using the laptop in a quiet room. Not a big deal, but worth mentioning. 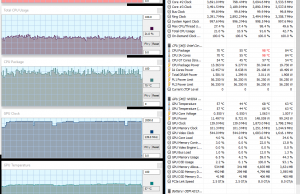 Now, back to the cooling system. 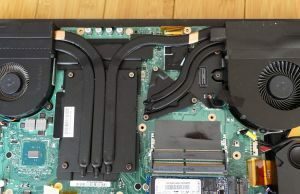 The two main fans are both connected to the GPU, and the one on the right also hooks up to the CPU trough a smaller heatpipe complex. 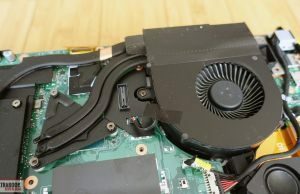 Acer uses a triangular base on top of the CPU, which I’ve seen some people on the forums consider a design flaw, arguing it’s unable to ensure proper or even temperatures across the entire CPU package. 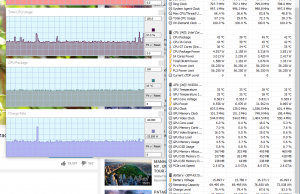 CPU cooling was indeed problematic on this test unit, but because it’s not a retail versions and I’m not allowed to repaste it, I can’t tell whether the temperature throttling was caused by the base’s design or just poor pasting. 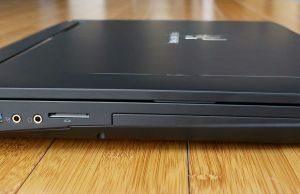 This is however something we should discuss in the comments section if you own this laptop or have info from others who own it. 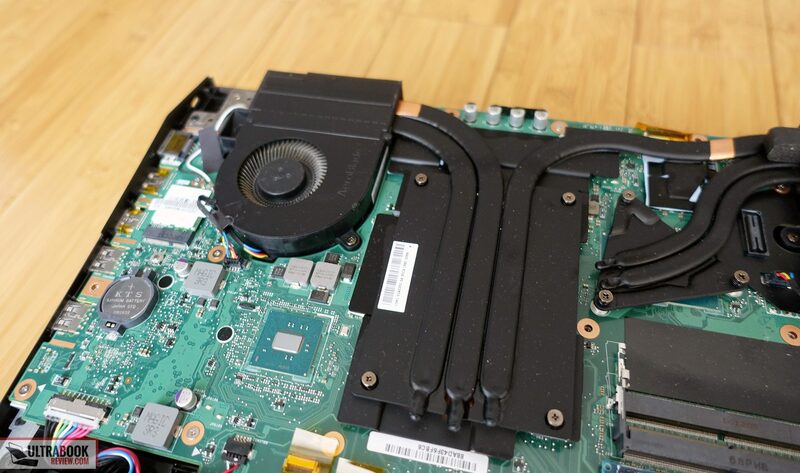 The GPU on the other hand is cooled buy a much larger base and thicker heatpipes, which do a solid job at keeping it running at full-speeds, even in stress tests. 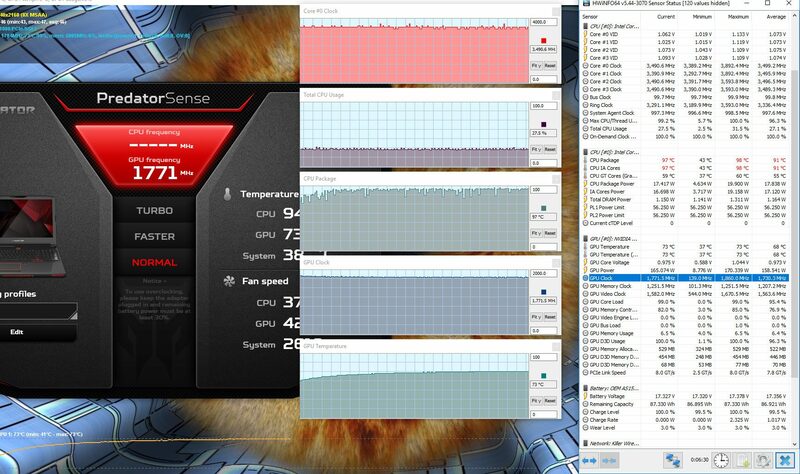 Speaking of temperatures, the CPU easily goes over 90 C in demanding chores according to HWInfo, while the CPU rests at under 80 C. Both are high numbers and other laptops with similar specs run cooler, like the Alienware 17 R4 tested here. 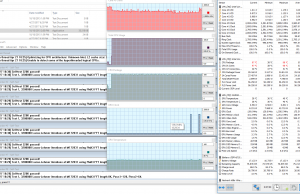 But again, keep in mind we dealt with a review unit and not a retail model, thus cooling might perform better on those. Connectivity wise, there’s Wireless AC, Bluetooth and Gigabit LAN on this computer. 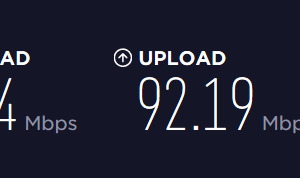 I’ve only used our test unit on wireless and the Killer 1535 AC module performed well, maxing out my connection when near the router and holding off well at 30 feet with 2 walls in between. That’s good news, cause although the wireless chip can be replaced, it’s not easily accessible. 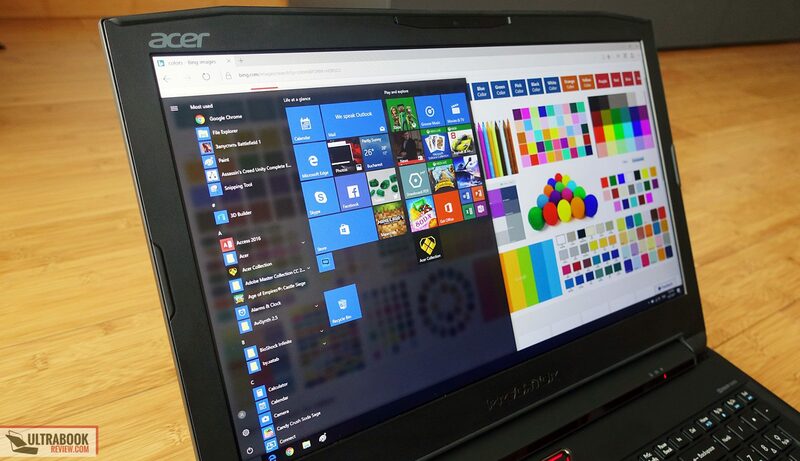 As a side note, Acer includes a software called Killer Network Manager on their Predator laptops, which help user control exactly which app uses the connection and in which way. 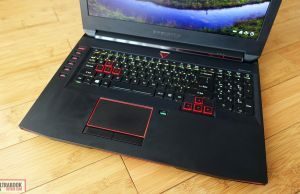 When it comes to the speakers, the 17X inherits the 4.2 system from the Predator 17, which means it gets four speakers placed towards the front side of the laptop and firing sound down and front-wards, through the cuts and red grills, plus 2 subwoofers hidden behind a red shield on the belly. The sound coming out of these is definitely not bad for laptop-sound, with a max volume of 84 dB and bass down to around 45 Hz. I did notice some buzzing nad vibrations on our sample at volumes above 60%, but based on other reviews and my experience with other Predators, final retail units should not suffer from this culprit. 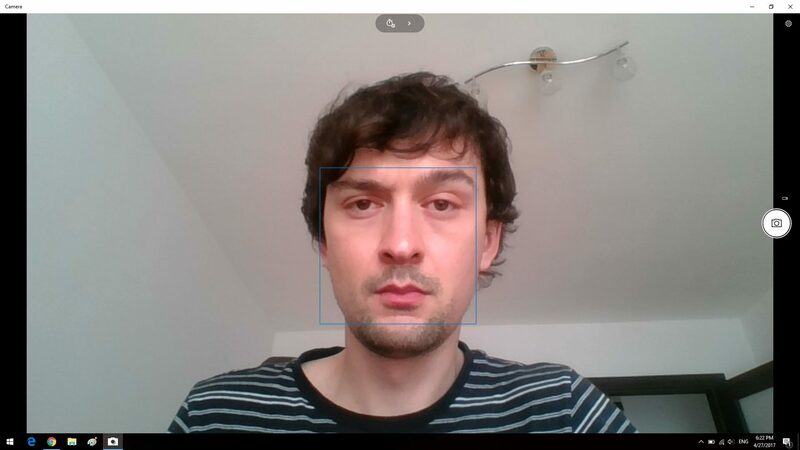 Last in this section we’ll mention the webcam, placed on top of the screen. It’s a decent HD camera, but grainy in poor light, so don’t expect too much from it. 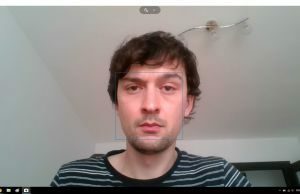 Should do fine for Skype chats, but if you’re looking to use the camera for webcasts and streams, a dedicated webcam will offer much better image quality. 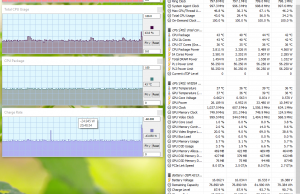 48.0 W (~1 h 45 min of use) – gaming, High Performance Mode, screen at 30%, Wi-Fi ON. 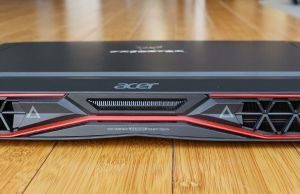 Acer pairs the 17 X with a massive 330 W power brick, which is required to keep that hungry GTX 1080 chip running, so there’s no way around it. A full charge takes at least 2 hours and 30 minutes, but can take longer if you’re playing games or performing other demanding tasks during this time. 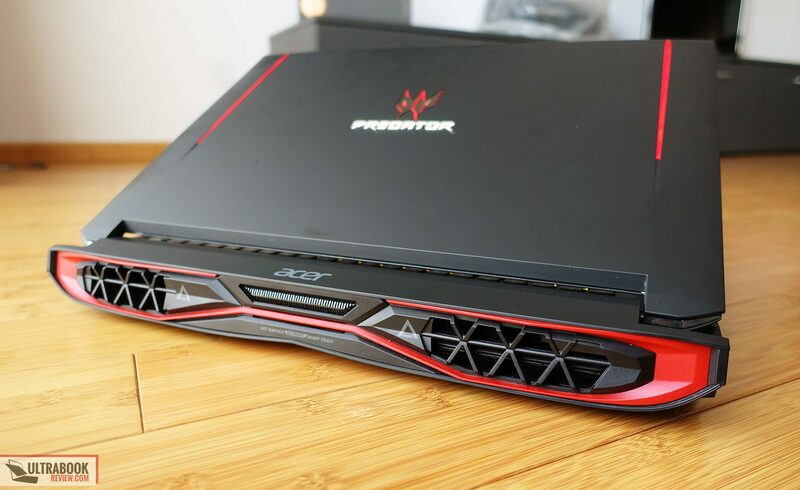 The Predator 17 X is available in a bunch of configurations, with the most interesting one including a Core i7-7820HK processor, the Nvidia GTX 1080 8 GB graphics chip, 32 GB of RAM, a 512 GB NVMe SSD and a 1 TB HDD, plus the 75 Hz FHD screen, for a total of $2699. $300 extra would get you the same specs, but the UHD screen instead. 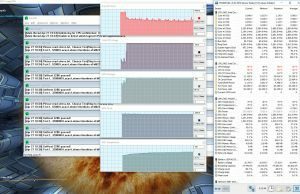 The Core i7-7700HQ configurations are not as widespread at the time of this post, but I’ve seen models with 16 GB of RAM and 256 GB SSDs going for under $2400 on ebay and other places. Follow this link for more configurations and updated pricing details at the time you’re reading the article. 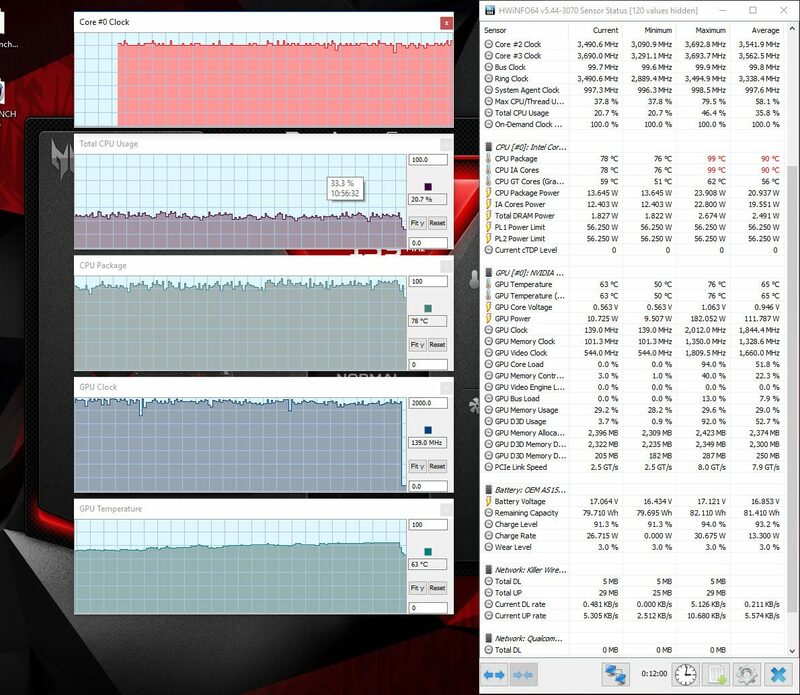 There’s very little wrong with the Predator 17 X. Yes, the design is perhaps a bit dated, and yes, it’s a massive computer, but it does what it’s supposed to well and it’s a little more affordable than the competition. Unfortunately our test unit did not properly showcase what the configuration is capable of. 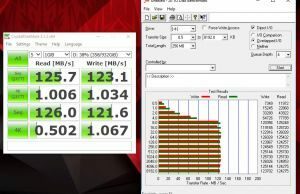 The CPU throttling we encountered and the inability to properly overclock the components with Predator Sense lead to lower benchmark results than other reviews managed to get with this laptop. 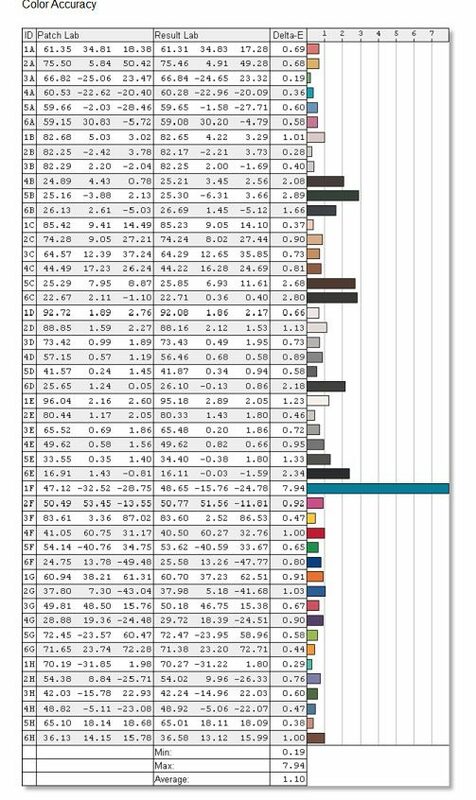 You can find details in this and this article and notice their numbers are better than what we got on our sample. 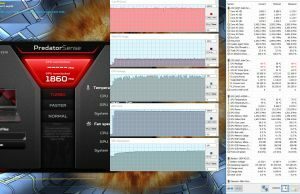 Based on those articles and the few forums posts I could find, the Predator 17X does perform as it’s supposed to, does overclock and won’t throttle under normal usage unless you use the Turbo Mode for a longer period of time, in which case the CPU will hit its thermal limits and slightly clock down from the overclocked frequencies, but still run at higher than stock speeds. 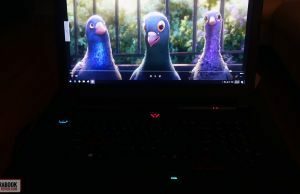 The notebook also runs fairly cool, despite the fact that the internals reach high temperatures, and not noisier than other gaming laptops, which are all traits potential buyers will appreciate on such a machinery. 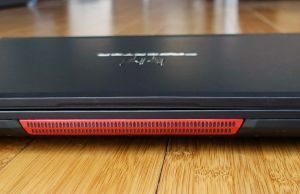 Given the nature of the sample we reviewed though, I do encourage you to read other reviews before deciding if this laptop is the one for you or not. 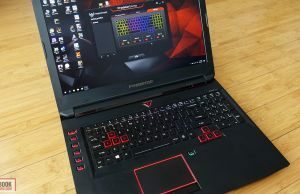 As far as competition goes, that includes 17-inch laptops with similar specs like the Alienware R17 R4, the MSI GS73VR or the Asus ROG G701VIK, as well as other laptops with Nvidia 1080 graphics mentioned here, each with their pros and cons. Which one’s better is something we can talk about in the comments section, where I’m also waiting for you overall impressions and feedback on the Predator 17 X. 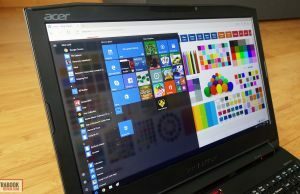 The most honest review iv seen on the Acer Predator laptop. The other articles did not look as far as you did. Thanks a lot. 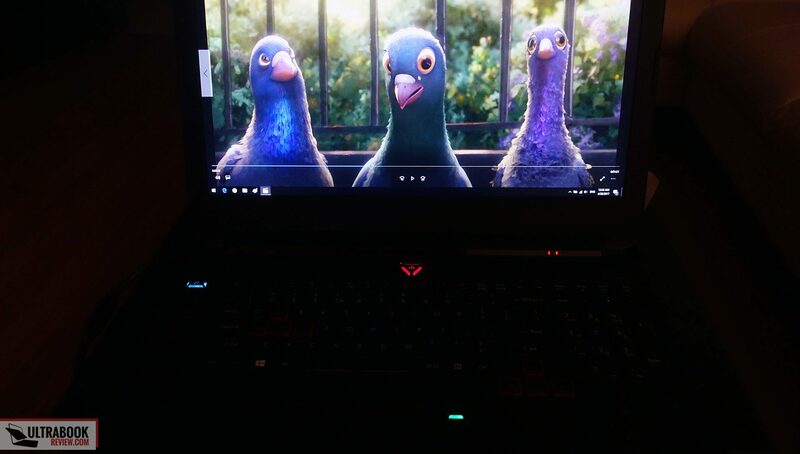 I do not think weight should matter since this is a gaming laptop. 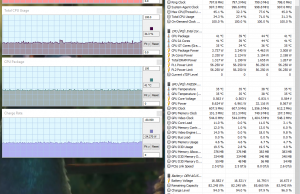 The battery life is is impressive as mine don't lasts only 2 hours. 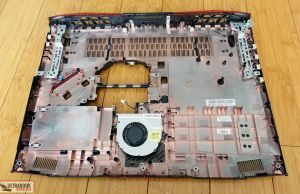 Well, you can remove it but that requires disassembly and you would have to get inside the laptop if you want to put it back. 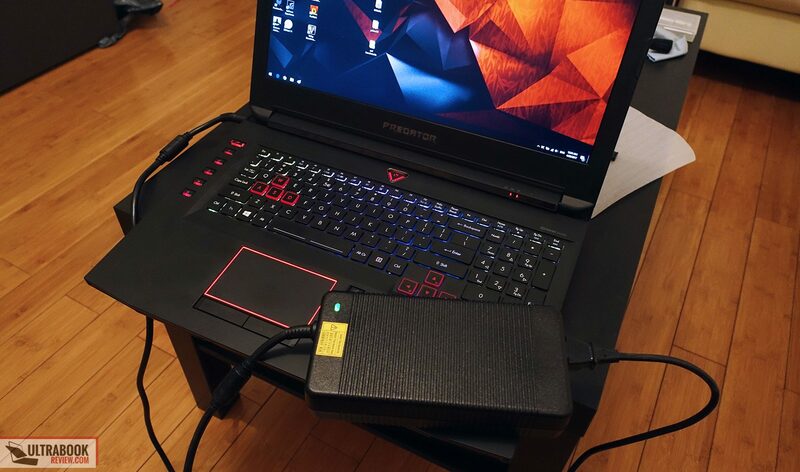 I wouldn't recommend it, this whole "use the laptop without the battery" thing is a myth imo. I have seen on Amazon, but on other websites and reviews on Youtube some show one type of backside vent and some show other type(As shown in this review). 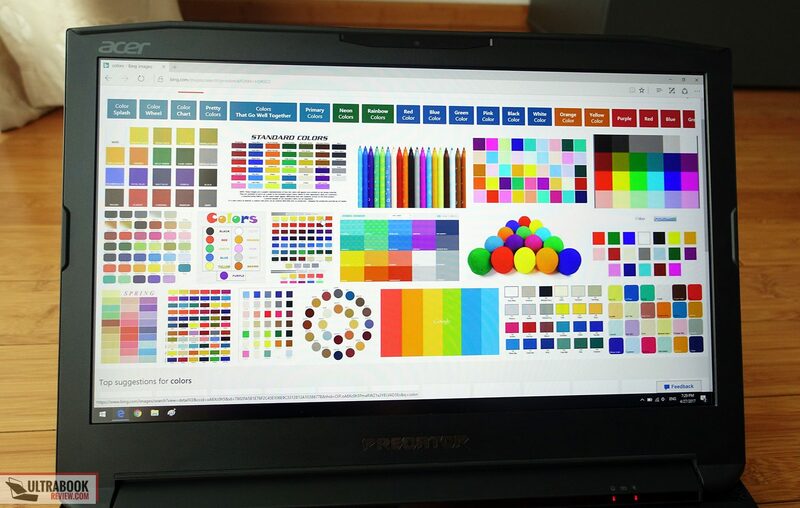 I am very much confused in buying Acer predator 17x because of this dilemma. Could you please clarify this ASAP? I would be delighted if you do so. I"m not aware of a version different than this one. What is the difference between the Acer Predator 17X GX-792-76DL and the Acer Predator 17X GX-792-703D?